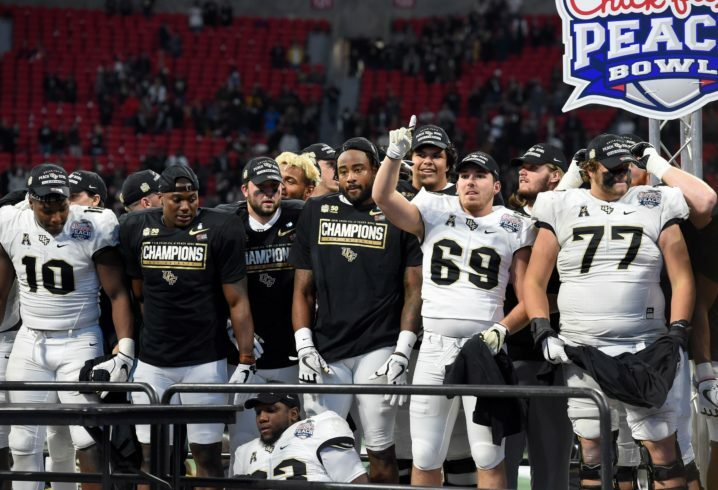 Central Florida has been beating the drum all offseason that its program is the true national champion of college football thanks to being the only FBS program left standing as an undefeated by the end of the season. Despite the undefeated mark, UCF never got a chance to prove its worth to the nation in the College Football Playoff. According to the executive director of the CFP, there’s an explanation for that — UCF’s schedule. During a recent radio appearance on The Opening Kickoff on WNSP-FM 105.5, CFP Executive Director Bill Hancock touched on if UCF was given fair consideration by the Playoff selection committee. UCF’s best win of the season came after the Playoff selections had been made by beating Auburn in the Peach Bowl. Prior to that victory, UCF’s only win against a Power 5 opponent came in a 38-10 win at Maryland. But non-power 5 teams CAN’T schedule like other the other teams. They have to play their conference opponents too. 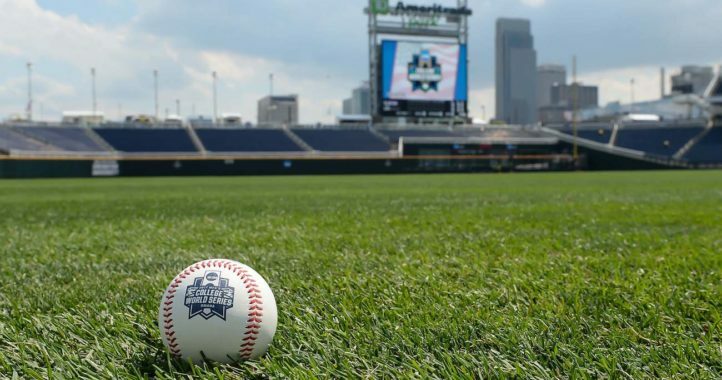 By their own admission, non-power conference teams will NEVER be considered for the playoff. It needs to change. How would you change it? Surely you aren’t arguing a school with that schedule that goes undefeated gets in over a 1 loss ( maybe even a 2 loss) P5 team who plays a much tougher schedule. Unless you eliminate the conferences altogether and just have all schools independent they will never be able to have a formidable schedule. Simple: Those G5’s who believe they’re a cut above the rest can load up on P5 non-con games. If they’re really that much better than the other G5’s, the conference schedule is really fluff. Exactly. They can play their OOC games against power 5 opponents. That will give them at least 3 maybe 4 power 5 team’s a season…..
Again, *how* can UCF actually *schedule* P5 teams?!?! Texas just *dropped* UCF to schedule Alabama! There’s also *no* guarantee a P5 team will be good when UCF plays them years after being scheduled. This is P5 arrogance at its finest, especially when the NCAA’s own RPI says the AAC’s strength-of-schedule was *tougher* than then Big 12 and PAC 12 in 2017 (#4 overall). The AAC suffers from lack of branding, being around only 5 years. The AAC is the Big East, who sold the name to the Catholic-7, and have accomplished more in 5 years than the Big East did in its final 10 — with no automatic bid either. Heck, under the old BCS rules, the AAC would have re-qualified as an AQ because it continues to finish 3 teams in the top 25, let alone a top 10 whenever they actually get a NY Bowl invite (3 out of 3 now, all against top 10 Conference or Divisional Champs). I would imagine any P5 team would help out better than Austin Peay….. So Texas dropped UCF. Is that the only team they are going to try to schedule from the P5? USF just bit off 3 games against the Gators. If UCF (or Memphis, or Toledo) want to get taken seriously, follow the Boise model – aggressively pursue at LEAST two P5 non-cons a year. And I don’t mean the dregs like Maryland. You get, say, Oregon and Kansas State on the schedule one year. Maybe Michigan State and Texas A&M another. A couple of years like that, and doing well, builds credibility. Boise didn’t get to the level they are by beating up on the Mountain West and then Austin Peay. You wanna run with the big dogs, you gotta play ‘em. It’s as simple as that. Even for the four non-conference games, you can only play P5 teams that are willing to schedule you. UCF has a hard time finding P5’s to play. From 2020 onward, UCF’s schedule is very bare…and it’s not because our AD is sitting around twiddling his thumbs. Few P5’s seem interested in scheduling a series. As for upper level P5’s…Stanford is coming to Orlando in 2019 for the back end of a home and home. Too bad more schools won’t step up like they are. Key word – “series”. You are a relatively new football program in a thrown-together, afterthought conference, with a whopping 45,000-seat stadium you can’t fill, who went winless just a couple of years ago. Of COURSE no traditional power will give you a return game. Why would they? There is zero upside. You want to toughen your SOS to be relevant, you have to play those tough non-cons away. It’s this newfound egoism of thinking you deserve a home-and-home series with the big boys that’s got your slate empty in the future. Bama, USC, Ohio State, Georgia, et al ain’t coming to your Junior League house to play – but will very likely welcome you to one twice that size. Fair? Maybe not, but this sport revolves around $ and playing UCF in Orlando is NOT going to be half as profitable as a home game against fill-in-the-blank or a road game with 85,000 in the stands and prime TV coverage. But UCF can*not* even get *away* games any more. It was bad enough after 2013-2014, and now it’s *worse* 2017-2018. UCF has joined the *small* club of having not 1, but *2* NY bowl wins against top 10 teams, in barely 5 seasons. Besides, UCF did 4 home games, all others away, in the ’90s when it wasn’t in a conference. FSU did the same thing … when it was *not* in a conference. But then that changed once both programs got a solid following at home, and focused on revenue. I mean, look at UCF’s TV share compared to the bottom half of the P5 — or as I call it, the P3+2 (Big 12 and PAC 12 don’t count any more) — and you start to see what UCF’s beef is. The numbers are there, have been there since the late ’00s as reported by USA Today, NY Times and even ESPN. UCF overtook Miami as the state’s #3 fanbase several years back. I’ve read quite a bit on UCF message boards about the difficulty of scheduling home-and-home series, but not much about being passed over for away games. In fact, there are some fans pleading for the AD to accept the fact that one-and-domes on the road are the only option to get teams with cred on the schedule. There’s also the fact that very, very few teams want to play in Orlando’s oppressive heat and humidity in September. What I’ve not seen is any direct talk about “difficulties” the AD has had in seeking out away games against P5 teams, other than the fact that UCF want $1.5M for an away non-con game. The athletic dept is being very closed-mouth on this subject, which leads me to believe not a lot of effort is being put into it. Hardly surprising given that the same administration is behind the incessant “national champion” hoopla. I simply don’t buy that UCF can’t get away games against serious competition, at least not until I’ve seen some details of actual turndowns. I can think of at least twice that UGA has scheduled UCF in Athens. Your point about FSU is spot on. After changing over from a girl’s school in the 1940s, it took a long time and many, many road games for FSU to reach a level of acceptance in football which allowed them some scheduling flexibility at home. It’s building your brand. Fandom – and stadium seats, the real gauge of success, not TV viewership – take time. UCF is blessed to be in a region that is overflowing with talent. It’s also cursed to be in a state that has 3 established football powers, and picks up a number of bandwagon fans when one or more of those powers is down – like last year. It’s going to take time for real fans to become truly invested in the school and draw more than 26K in a down year. And UCF only got Stanford because Stanford was shocked that they were #2 … to #1 UCF … in APR among the final AP top 10 teams in 2013-2014. So it was scheduled as an “Academic” challenge, Home’n Home. UCF’s current P5 ACC opponents were largely AD/HC relationships (Stansbury/O’Leary). No Big 12 has scheduled UCF in over a decade, and *all* the existing ones have pulled out … K-State and now Texas. That’s not entirely true…. Kstat played UCF in 2010 and Missouri had UCF scheduled they just ended up switching conferences before the game happened..
Alabama and Texas just scheduled one another. Texas dropped UCF from its schedule, like many others — especially in the Big 12 as of late — have done. Especially as the top of the AAC keeps beating the Big 12. At some point, people need to admit what everyone else knows … UCF has *no* chance to schedule, and in the past (e.g., 2013), only ‘got lucky’ that some teams were good the years they got to play them. This is the plight of UCF and most AAC teams, even though the AAC is not only the best of the G5, but according to the NCAA’s own RPI algorithm, had a more difficult strength-of-schedule in 2017 than either the Big 12 or PAC 12. You’re talking ‘Bama scheduling a FCS team, right? UCF cannot even get P5 programs to schedule them ‘last second,’ with the P5 at home, any more. That has become UCF’s sole ‘chance’ in the ’10s, as all Big 12 teams have bailed on them. It’s now just left to a handful of ACC teams that are willing. You don’t see the difference? UCF has to use their OOC to help their SOS because their conference is weak…. Instead they schedule FCS opponents…. Are you for real? *WHO* will play UCF? UCF ‘gets stuck’ with other G5s and, when they won’t, FCS teams. Even when there’s a ‘last second’ opening for a P5 that lines up well with UCF, UCF cannot even get those any more — away (at the P5 home). It’s not about teams not being willing to play UCF. It’s about UCF trying too hard to get a home-and-home series with P5s. It simply ain’t gonna happen to any real degree. If most P5 teams go on the road for a non-con, they want a serious $ return for giving up a slam-dunk home game. UCF in Orlando does NOT fit the bill with a capacity of only 45K. I keep going back to the Boise model, or even Fresno State’s best era of anyone/anywhere/anytime, but it’s gospel for G5s: you want cred, hit the road against as many P5s as you’re willing to take on. I’m sure most P5s would love to have UCF come to town, but they’re not going to give a return game. 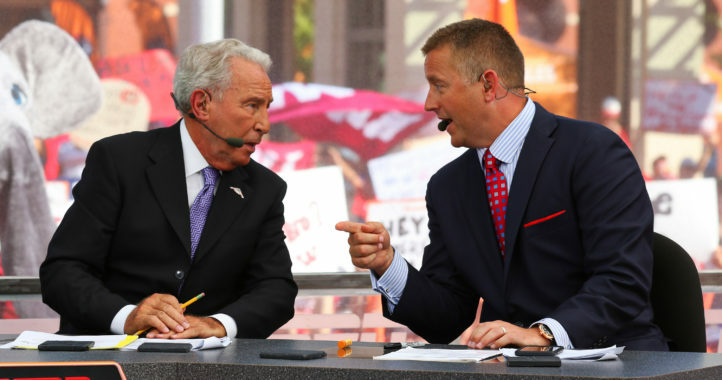 You gotta pay dues to elevate your profile – it won’t come just on the result of one bowl win against a thoroughly discouraged, disinterested, and beat-up traditional power. So, what part of Bama’s schedule made it so much harder? Colorado St, Fresno St, and 5 win (FCS) Mercer? Six loss Texas A&M…8 loss Arkansas and 8 loss Tennessee (all of whom were so bad they fired their coaches)? Seven loss Vanderbilt, 6 loss Ole Miss and an LSU team that lost to TROY??? Being In a P5 conference Automatically makes it better… The SAC doesn’t have a winning record against any power 5 conference….